On Friday, Nanjing officials announced that they’ve decided to further investigate what needs to be done with the growing bike-share enterprises here. And in doing so they’ve signalled what matters to them about this growing challenge for local governance--actually being able to make and coordinate policy. On Friday, the city’s Municipal Transportation Bureau [市交通运输局] issued the draft of an Opinion [南京市促进网约自行车健康发展的若干意见]—a common administrative measure—“draft for comment” [征求意见稿] designed to solicit public reactions for a 24-day period before regulations are brought into force. Some local governments bury such announcements, hoping that no one notices or cares. Nanjing doesn’t dare: its citizenry is far too attentive and officials much too connected and invested here to rely on that tactic. Among the proposals in the Opinion are that bike-sharing firms will be required to provide real-name registration of users; set up operation-and-maintenance teams for the bikes; purchase personal accident and third party liability insurance in case of accidents; prohibit children under the age of 12 from using bikes; and create measures by which shared bikes are not distributed within residential areas as well as pickup those bikes that are illegally parked. The account in Nanjing Daily also mentions that at least one of the bike-share enterprises has enlisted local university students and volunteers to help police the placement and use of their particular brand of bicycles, essentially so that the local government doesn’t do that for them. 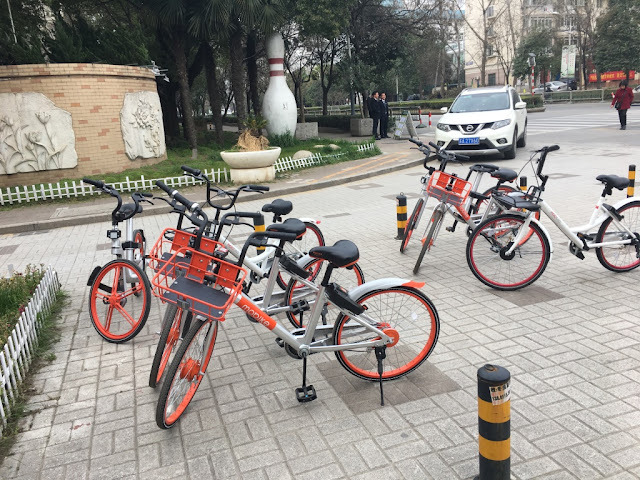 In addition, the Opinion notes that bike-share enterprises must make plans to tie-in their operations with Nanjing’s overall transportation management system. That’s to say, violators of these regulations would be treated the same as those who contravene city traffic laws when they’re driving a car or riding a motorcycle. That’s an ambitious agenda for a new problem. 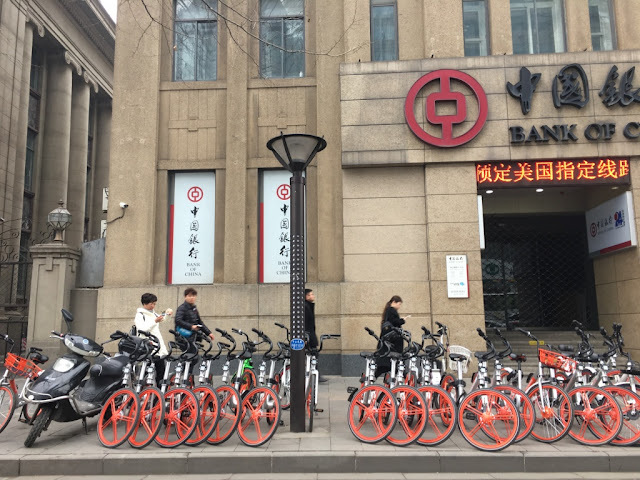 Nanjing is clearly not trying to ban bike-sharing, but make this very new phenomenon part of urban management initiatives here and in a growing number of Chinese cities—that is, where individual behavior becomes part of a collective assessment of one’s “social credit”. That is, if you ride, break or park a shared-bike illegally, it will become part of your permanent record. Suddenly bike-sharing is part of this new social portfolio. All that makes sense insofar as policy is concerned—and in particular, the issuance of an “Opinion” instead of a directive. Nanjing’s opening attempt to deal with the bike-sharing challenge here took some residents by surprise, and citizens made their dismay known. City officials clearly want to make sure that pushback doesn’t happen again just because no one bothered to ask residents what they thought. At the same time, it’s important to restate what occurred here in Nanjing: Nobody demonstrated, protested, or shoved city government here into doing what they wanted—in part because there is no “they” here in China; the country is far too far-flung and diverse for generalizations. What actually happened was that officials here examined where they fell short earlier this week, and decided that they better make better public policy by being comprehensive and consultative at the same time. For those looking for civil movements in China challenging political authority, this isn’t one of those (and good luck finding any of that here anyway). This is just smart policymaking, after a stumble—a city government looking to do better by its residents and itself (and staving off Beijing from trying to do something that’s unfit for Nanjing’s situation). For the first time, [with this Opinion] the management responsibilities of various Departments about shared bicycles were made clear. The Traffic Administration Department is responsible for supervision and management of the industry; the Planning Department is responsible for improving the slowdown in the traffic system [brought about by the proliferation of shared bikes]; the Urban Management Department is responsible for parking order in terms of guidance and supervision and management; the Traffic Control Department is responsible for registration of the card and traffic management; and other relevant Departments—Commercial Vehicles, Quality Supervision, Network and Complaint Office, the Office of Finance, the Nanjing Branch of the People's Bank of China—are responsible for the implementation of other relevant supervision and management matters. In other words, let’s all make sure we’re riding in the right lanes where policymaking is concerned. That’s more important than it might seem. Creating actual public policy in Local China--that is, an organised official response to a perceived social problem--by coordinating responsibilities in the bureaucracy is tough. It's also one of those challenges in China that’s largely ignored by analysts who seek out social change that’s driven by activists and NGOs. Of course there are individual instances of the latter, but that’s all they are: instances, rarities that might make good reading but don’t produce actual reform. That’s what local officials do (call it "grassroots governance"), and that’s what occurring here in Nanjing where shared-bikes are concerned. It may not be exciting stuff; but it's the stuff of which Chinese society and Chinese citizens are concerned with--because it’s about their lives and rights as they are, not as some might wish them to be. Another thoughtful, well-written, focused piece. Thanks. I showed your last post to a friend, Jeff Brown, who has an international podcast and he would like to interview you. If he has not already contacted you, is this the best place to do it, or do you have a Contact Me form? I would like to excerpt this entire post for a book I'm writing for Penguin, China 2020: Everything You Know is Wrong. It's a good microcosmic example of policymaking. Let me know your thoughts. Great article on this blog, as usual. Like Nanjing, the shared bike phenomenon has taken Shenzhen by storm and has been quite disruptive in a number of areas. My wife and I were walking along the Mangrove Harbor boardwalk recently and we were joking that it was starting to feel like the early 90s, being surrounded by a growing sea of bikers. I'm with Godfree...How can you be contacted?